Coburg railway station is only about 15 minutes away from the center of the city by foot. The station is daily reached by trains from the Deutsche Bahn. Coburg can be reached by car via B 303 Schweinfurt-Coburg-Schirnding, motorway A 73 Suhl-Coburg-Nürnberg or B 4 Hamburg-Coburg-Nürnberg. Follow the signpost to the city center. Nuremberg Airport (Flughafen Nürnberg) is only one hour away with a car. Journey time by train is approx. 2 hours. Take the U-Bahn 2 to Nuremberg main station (Nürnberg Hbf) and then a regional train to Coburg. Coburg – the Europe city – has one of the largest castles in Germany, the 'Veste Coburg'. In total there are 20 old and very fascinating bridges over the river 'Itz' in the city, visitors can cross and admire. Above the wonderful town Coburg in Bavaria rises to the Veste Coburg citadel (Martin Luther resided here in 1530). The castle was first mentioned in 1225. At the base of the hill, the Ehrenburg Palace (Schloss Ehrenburg) was rebuilt in 1543-1549 and renovated until the 19th century. Today the Ehrenburg houses the Landesbibliothek Coburg and is a museum. Coburg is rich in interesting monuments, buildings and wonderful fountains. There are countless houses from the 16th, 17th and 18th centuries: St.-Moriz Church, Gymnasium Casimirianum, Coburg State Theater, Town Hall, Callenberg Palace, Hahnmühle, Zeughaus and others. Moriz Church in downtown is the oldest church in Coburg. Easter of 1530, Martin Luther preached in the Church. The city offers the opportunity to go to the theatre and the opera that offer varying events. The nature and parks guarantee special and fascinating views and very relaxing and recovering times. Johann Strauss, known worldwide as the "Waltz King" (Walzerkönig), lived the last 13 years of his life in Coburg. Coburg offers a large park with a lot of nature to explore. Only a few minutes away from the centre is the park and the river Ilz, wonderful places for taking a walk. Special and fascinating views over the city are guaranteed, relaxing and recovering times, too. Not only in the centre of Coburg visitors have the opportunity to try the delicious Coburg sausage (roasted over a pine cone fire), the famous local speciality. Many restaurants and bistros offer the speciality with delicious dressing. 'Coburger Bratwurst' are always offered with bread and/or dressing, best sausages in the area and very worth trying. Since 1992, Coburg is the Samba Capitol of Europe. Every year (on the second weekend in July) countless Samba bands give the Coburg visitors an unforgettable rhythm noise. Worldwide a larger Samba Festival is nowhere celebrated outside of Brazil as in Coburg. Enjoying a peaceful location in the heart of Coburg, just 100 metres from the marketplace and pedestrian area, this traditional hotel offers gourmet cuisine, a sauna/beauty area and individually designed rooms. 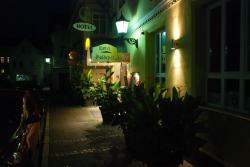 This modern, 4-star hotel is located in the town of Coburg, just 500 metres from the Rosengarten congress centre. It offers free Wi-Fi, a bar/lounge and 24-hour reception. This family-run, 3-star hotel offers comfortable accommodation and free Wi-Fi internet access in the heart of Coburg, just 400 metres from Ehrenburg castle and 600 metres from the impressive fortress.